The soccer news starts with the USMNT in action against Ecuador at 8pm ET on ESPN2. The preparations for the game at Orlando City Stadium focused on USMNT coach Gregg Berhalter making his preferences known in advance for his first choice squad. Ecuador is the 9th-ranked team in CONMEBOL, 58th overall in the FIFA World Rankings. It's a different calibre of opponent than what the USMNT faced in February, but it's also a different version of the US National Team. With that in mind, here are three things to watch for tonight in Orlando. It's easy enough to point to that with any USMNT roster in recent memory. More often than not, there's an issue with the back four or three. Whether it's availability, tactical issues, or positional play, the backline has been a problem for multiple USMNT coaches. Berhalter's way of addressing this is to go directly at it prior to the first March friendly. How Tyler Adams and Deandre Yedlin play in a Berhalter eleven has become the story, but there's more to it than that. If Berhalter is looking at a tactical shift from the very first game with the full national team, his message is obvious and clear. This is a squad with set tactics looking to fill positions rather than an all-star team. That means playing well within an existing system that should offer some stability. At least for now, that should benefit the program. It's easy to talk up the attacking players in the USMNT midfield. Wherever Adams plays in Berhalter's system, he's an offensive threat. Weston McKennie and Christian Pulisic finish out the group of young Bundesliga players shouldering significant expectations in this camp and this summer's Gold Cup. They're pushing a group of forwards where Berhalter has options. The return of Jordan Morris and Berhalter's trust in Gyasi Zardes's game could create some free flowing scenarios for the USMNT. That could show a style of play that brings the attack to teams like Ecuador. That's what most coaches want in theory, but bringing it into practice can be risky. Berhalter has Michael Bradley in the defensive midfield roll, with all involved well aware that Bradley's passing can change a game. From the outside, this doesn't look like a squad built for the scoreless draw. An easy criticism of some versions of the USMNT is in showing too much respect for the opposition. The era of lining up two defensive minded midfielders in front of a four-man backline against an already over-matched opponent led to limited attacking opportunities. That wasn't Berhalter's style in Columbus and there's no expectation he'll avoid risk at USMNT level. The reorganization of the USMNT technical system has stressed the importance of developing creative teams, and this is a dress rehearsal for what they want to see. It's once again a program that's waiting for the opportunity to show progress on the field. Fortunately for all involved, this is a squad playing a schedule that favors them doing just that. Yahoo's Doug McIntyre on what to expect from the USMNT on Thursday. The LA Times' Kevin Baxter's preview of USMNT vs Ecuador. AP's Ronald Blum with Berhalter focusing on possession. MLSsoccer's Matthew Doyle predicts how Berhalter's lineup will look against Ecuador. 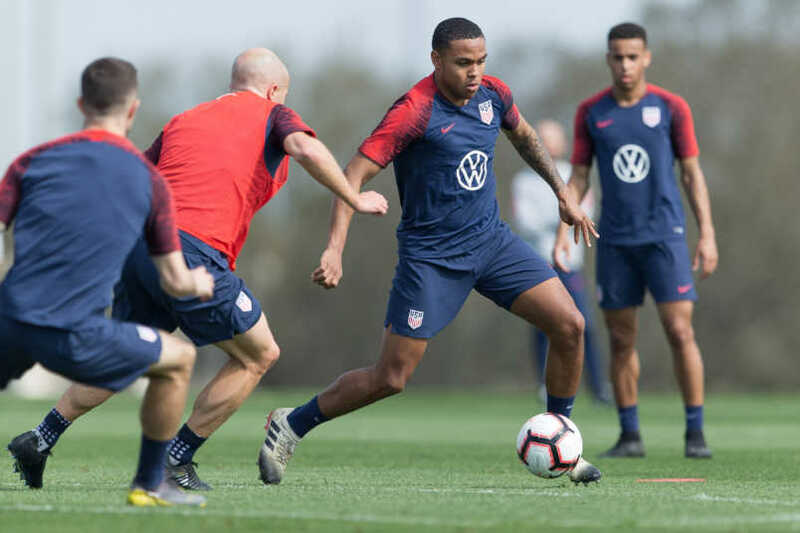 SBI Soccer's Ives Galarcep focuses on Tyler Adams in the new look USMNT. The Fort Lauderdale Sun-Sentinel's Brittany Wallman reports on Inter Miami's plan for Lockhart Stadium. The Guardian's Jonathan Wilson on Lionel Messi winning with Argentina.